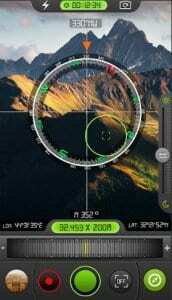 Military Binoculars Simulated – is one of the best binoculars apps if you hold an Android device. The developers created a unique design simulating real army binoculars. The app is absolutely free but contains many ads. Zoom an image in and out. (this action is accompanied by a specific sound). The magnification is up to 4 times. 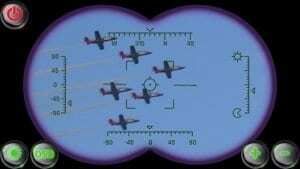 The app displays some of the observed information on a screen looking very similar to the professional military binoculars. Ability to take a snapshot of a magnified image to have a better look at the interested object. In situations when you need to have a better view of distant objects, the Military Binoculars app will perfectly suit your needs. 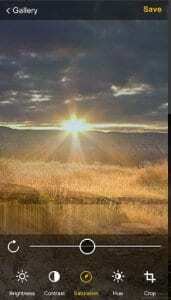 It can be used for hunting, or hiking, or any other outdoor activity. Note that the clarity of the image depends on the capacity of your device camera. Binoculars G44 is professional digital binoculars available for both Android & iOS platforms. The app will ask your permission to take photos and videos. The app has a built-in compass which can be helpful in the woods. The app has a 30x zoom. Night mode. You can light up the image in a dark environment to enhance the clarity of a picture. There is a Black & White mode to change the chromaticity. You can not only take photos but to record videos. The app has its own folder to store all videos and photos. All features are shown on the screen and can be accessed with one click. There is also a button on the screen that suggests removing ads. You will have two options. Either to remove ads just for 24 hours by watching advertising video or purchasing unlimited free-ads access for a small fee. The most popular app for Android users that has been downloaded for more than a million times. Enhance your camera and enjoy a better quality of zoomed pictures. The app is available for free on the Play Market. It can be considered as the easiest app with a simple design consisting of only a few buttons and zoom scroll. Press the blue pointer and swipe it to the right to magnify the image. First, you can zoom in and out the image to see the distant objects clearer. Second, you can make a fast snapshot and see it in the gallery directly from the app. Last, change the way how binoculars are displayed on your screen. 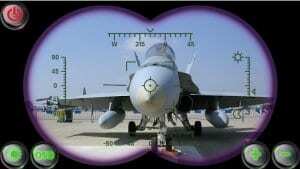 Either it’s a full-screen picture or a different way of binocular simulations. So, hold your phone horizontally like you holding real stereoscopic binoculars. This simple binoculars app was created for iPhone and iPad users. Easy to use and free binoculars will always be in your pocket, no matter what place will you visit. Whether you want to see the Eiffel Tower or a tiny squirrel in the forest. 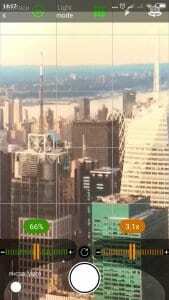 Take a look at tiny elements on landmarks with the help of the digital binoculars. Zoom an image in and out to magnify an object. Capture the photo of the object in order to take a look at it later. The flashlight is managed through the app. 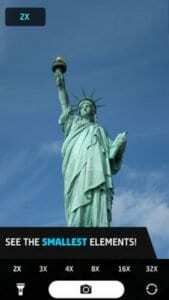 You can use it to illuminate objects things for a brighter image. The app is free with some small ads. Full-screen advertisements have been recently removed. 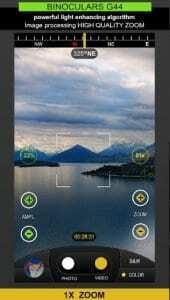 Military Binoculars/Night Mode/Compass Camera app claims that is a binoculars simulator supporting a night mode. 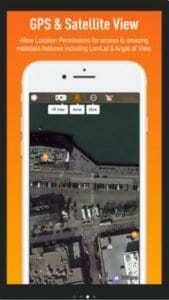 The app can be used as digital binoculars or a magnifying glass. With its powerful zoom, you can take photos of far and near objects magnifying them. Built-in compass for better orientation and navigation looks like an actual instrument. You can turn compass on and off by simply pressing on its logo on the screen. Take photos and record videos directly through the app. The app will create a folder to store all media files. Editor`s functions. After taking a photo you can edit its brightness, contrast or even crop the image. With the Military binoculars app, there is no need to carry out extra equipment such as real binoculars or magnetic compass. The app can be very handy while macro shooting too. Download this up in no time and enjoy it for free. The ads can be removed by purchasing the app`s premium version or watching advertising videos. The last option allows you to remove ads for 24 hours. The Binoculars is an easy to use modern application for iOS devices. 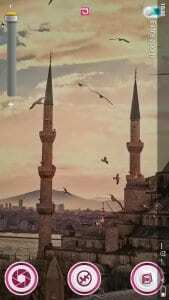 You can use it for free with some ads or remove them for about 0.90$. The Binoculars is a replacement for real binoculars that can be used in different circumstances. The main feature is to provide you with a better view of distant objects. 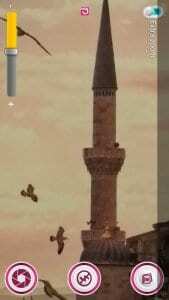 Zoom the image in and out to magnify the image to see a small object anywhere on a faraway landscape. 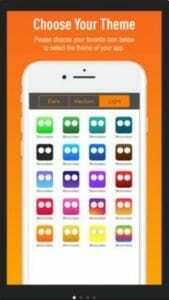 Choose a theme of the app. There are about 20 different options and colors for you to choose from. A built-in GPS will allow you to get your latitude and longitude coordinates and remember the exact location of your pictures. See far-away objects more clearly using your iPhone. With the help of the app, you can watch wildlife wherever you go. The app uses the full resolution of devices up to 12 mp. It’s recommended having more than 8px camera to have a clearer view. 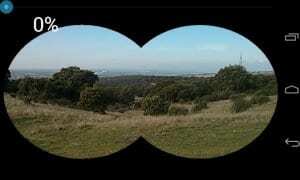 Turn your smartphone into a handy binocular with the Binoculars Free app created for Android only. A free and easy-to-use application without extra features will provide a zoom similar to a real pair of binoculars. The app includes an Advanced night mode that can be very useful in a dark time. You will not be able to take photos with this app and there is no built-in compass. This app is created for simplicity lovers who don’t need any additional features. There is no premium version to buy to eliminate advertisements. An easy to use application with a user-friendly interface for Android devices. With the help of this app, you will turn your phone into handy digital binoculars that will always be in your pocket. Now you will be able to see objects in the far distance. The flashlight can be turned on/ off from the app in the case you use the app as a magnifying glass. The quality of zoomed images depends on a built-in camera of your device. Thus, if your camera isn’t one of the best ones do not try to enlarge an image to the maximum. The app doesn’t take much space in the memory of your device. Binoculars HD Camera Long distance is a relatively new application launched at the end of 2018 but it has already been downloaded for more than 10 thousand times. If you own an Android device, do not hesitate to start using it. Use the scroll to zoom an image in order to view far distance objects and their elements. The app will let you take a photo and record videos of the objects you observe. 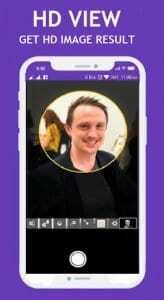 The developers claim that the app`s images in high resolution. In addition, you will be able to involve the front camera in the process. The app main function is to enhance your smartphone functionality. So, the app will have a different effect on various devices according to its capability. 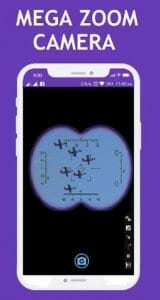 Download the Military Super Spy Zoom Binoculars app and turn your phone into professional army binoculars. The app is free to download but it has advertisements. You will be suggested to remove them by purchasing a free-ads access. The app requires to register via facebook but you can easily skip this part. 45x zoom. Zoom in and out by pressing on “+”/”-” signs on the right down part of the screen. Light up the image by pressing on “+” and “-” signs on a green pointer on the screen. The light level is displayed in percentage. Take HD photos and videos directly through the app. There is one pointer for both photo and video modes that can be switched by swiping left and right. You can change the light mode before taking photos. There are many different modes pre-installed: an incandescent, a fluorescent, daylight, a twilight or set it manually. 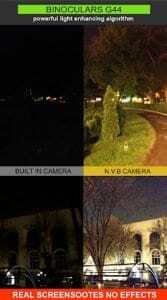 Switch autofocus on/off us if necessary. In a case, if you don’t need binoculars the app can be very helpful in other different situations. Your smartphone camera capabilities will be enhanced and you will be able to shoot nice pictures in various circumstances. The app improves your camera zoom functions so you can easily take good photos of far distance objects. Maximize your iPhone`s camera zoom by Binoculars app. The app is free and compatible with iPhones and iPads. It has all features that can be useful in situations when you need to see far away objects. Zoom in for better vision, snap a photo and share it via social networks. You will find the app very handy while traveling, hunting, or just walking in the forest. If you get bored from the interface you can change a theme or binocular frame. The app won’t take much space on your phone. It launches in no time whenever you have an occasion requiring to zoom the image in. Unlikely it can be used in low light situations when you need to see far objects. In the case you need to use the app as a magnifying glass, the flashlight will assist you.